Video marketing is a very powerful form of online outreach that helps your SEO. This is why you see text- and photo-heavy sites like Airbnb capitalizing on it today. As we watch online video continue to evolve and mature, we’ll also see new and compelling business being discovered. These companies are important to keep your eyes on because they demonstrate the limitless possibilities and audiences you can reach by creating videos for your brand. SEO statistics show that YouTube and Snapchat generate 15 billion combined views daily. There are about 500 million additional users who also watch Facebook videos daily. This demonstrates that people are eager to watch videos wherever they can find them. It also means that your brand needs to share videos on all relevant channels. Doing so gives you the opportunity to offer up little reminders about why your company is the one they need to do business with – even if they’re not ready to buy your products or services right now. • Facebook: About 85% of Facebook users play videos without the sound. This means you’ll need to revamp the silent film for them because they’ll miss out on any voiceover narration or dialog you’d otherwise include in your video. Instead of audio, try including text, charts, graphs and visual storytelling features so you can still communicate a complete message. • Twitter: Users like short videos – only about 45 seconds in length. This makes sense, considering Twitter users are looking for quick bites of information. Choose the appropriate topics for which you can condense information into digestible, memorable bits. • Instagram: About 97% of branded Instagram campaigns have substantially increased ad recall. You can use video as a jumping-off point to spark conversations between users. It’s also important to respond to your audience’s comments, ask questions, and develop rapport here though. • YouTube: With over 1 billion users (about one-third of the world’s online population), this is more than a video delivery medium. This is also a great place to answer customer-service questions by creating a video of frequently asked questions. It’s also a great place through which to show your customer appreciation. By meeting your customers where they naturally gather together, you can use your video here to resolve any real pain points your customers are facing. • LinkedIn: About half of all college-educated adults use LinkedIn. Most of these people are over the age of 30 who are above-average earners. These are the ideal demographics for certain markets – like business-to-business and high-end brands. If you own such a company, this is your chance to showcase thought leadership by sharing videos that comment on relevant market trends or grant insider access to industry conferences. You don’t want to share fun, casual content here though because it’ll look out of place. Instead, make sure the videos you choose to post here mirror LinkedIn’s professional image. 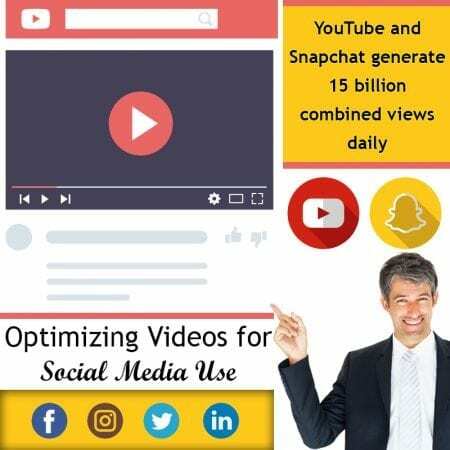 I SEO U can help you tailor your video content for social media channels so you can drive more views and boost engagement. They’ll also help you understand what platform is best for your audience so you don’t waste your time or resources. With their help you can truly align your content with your audience’s social behavior and boost your traffic and your bottom line so make sure you contact them today.